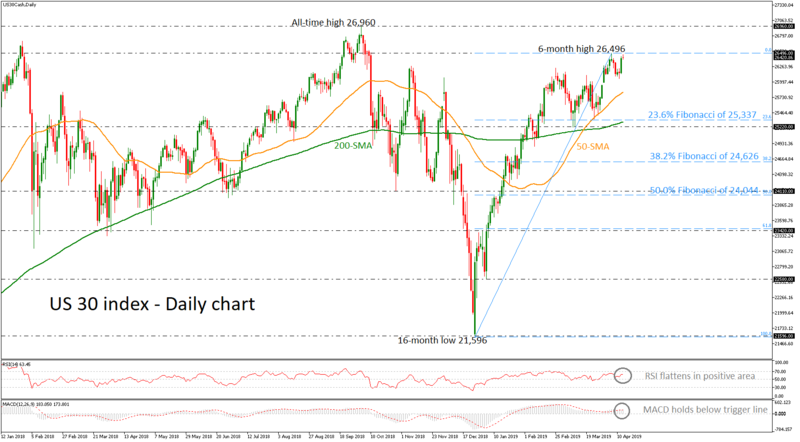 The US 30 index is hovering slightly below the six-month high of 26,496, remaining well above the ‘golden cross’ between the 50- and 200-day simple moving averages (SMAs). Today, though, the index is on the backfoot and the technical indicators suggest that the market could ease a little bit in the short-term. The RSI is flattening in the positive zone, while the MACD stands below its trigger line. In case of a correction lower, preliminary support may be found near the 50-day SMA currently at 25,822 as well as around the 23.6% Fibonacci retracement level of the upleg from 21,596 to 26,496 around 25,337 and the 200-day SMA. Falling slightly below this area would turn the bias back to neutral, meeting the 25,220 support.